In 1993, HSBC Holdings plc relocated its headquarters to London after having acquired Britain’s Midland Bank the previous year. Midland in turn had fully acquired Samuel Montagu in 1974 to form Midland Montagu. Samuel Montagu & Co was a City of London bullion broker, and one of the 5 original gold fixing members of the London Gold Fixing, and in turn, Midland Montagu was also a Gold Fixer. In 1999, HSBC began using the name ‘HSBC’ for the Gold Fixing seat of Midland Montagu. Between 1999 and 2000, HSBC completed the acquisition of Republic National Bank of New York. Republic National Bank of New York had been a big player in the world gold markets, and in 1993, Republic National had bought one of the London Gold Fixing seats from Mase Westpac, meaning that from 1993 both Republic National and Midland Montagu held Gold Fixing seats, and that HSBC ended up with 2 of the 5 Gold Fixing seats. Therefore, in 2000, following the Republic National takeover, HSBC in London sold one of its newly acquired seats to Credit Suisse. Anyone who knows London will understand that ‘central London’ refers to a small number of central districts, and not some broader inside the M25 (ring road) definition. Before moving to Canary Wharf in circa 2003, HSBC occupied a number of buildings clustered around the north bank of the River Thames, including 10 Lower Thames Street (the Banks’ Headquarters), 3 Lower Thames Street (St Magnus House), 10 Queen Street Place at the corner of Upper Thames Street (Thames Exchange – containing a trading floor), and Vintners Place (adjoined to Vintners Hall on the other side of Queen Street Place and Upper Thames Street). Until late 2014, the HSBC entity that was the custodian of the SPDR Gold Trust was “HSBC Bank USA NA (London branch)”. NA means National Association. On 21 November 2014, effective 22 December 2014, the custodian for the SPDR Gold Trust switched from HSBC Bank USA, National Association to HSBC Bank plc. HSBC Bank USA NA (London branch), until 2015, was also the HSBC entity that was listed as a member of London Precious Metals Clearing Limited (LPMCL) on the LPMCL website. See, for example, September 2009 imprint of LPMCL website. The next step is therefore to see where HSBC Bank USA NA (London branch) was formerly located. The Financial Services Register (FSA Register) lists HSBC Bank USA, Reference number: 141298, effective from 24 January 2000, with a registered address of Thames Exchange, 10 Queen Street Place, London EC4R 1BE. Recalling the Republic National connection, the previous registered name for this entity was “Republic National Bank of New York”, with the same address, effective from 18 December 1995 to 24 January 2000. The FSA Register entry also lists various well-known names of the HSBC gold world alongside this HSBC Bank USA entity, including Jeremy Charles, Peter Fava and David Rose. Recalling the Samual Montagu / Midland Montagu connection to HSBC, an entity called Montagu Precious Metals is also listed with an old address at “2nd Floor, Thames Exchange, 10 Queen Street Place, London EC4R 1BQ. which is the same building as West 39th Street, New York, in Manhattan. The precursor to the SPDR Gold Trust was called Gold Bullion Ltd, a vehicle set up by Graham Tuckwell, promoted by the World Gold Council, and listed on the Australian Stock Exchange. 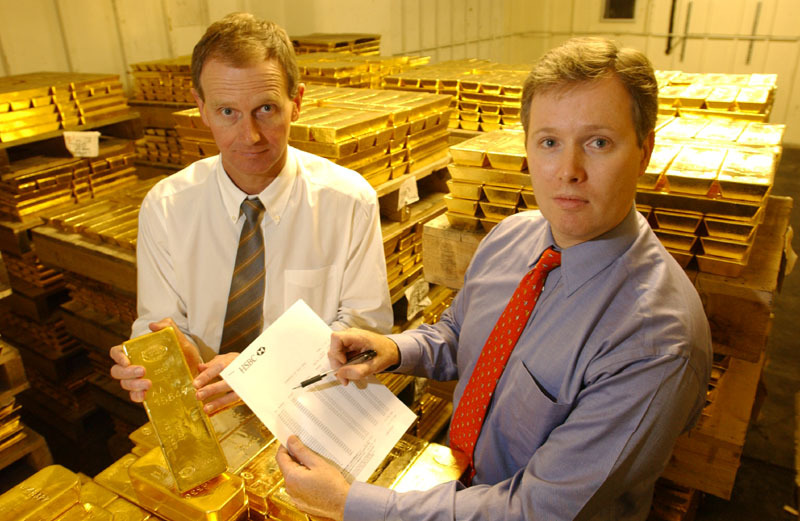 Gold Bullion Ltd’s first day of trading was 28th March 2003. Following Gold Bullion Ltd’s launch, the SPDR Gold Trust (GLD) was then launched in 2004, but originally it was called STREETracks Gold Shares, and it even had another former working title of ‘Equity Gold Trust’ in early 2004. Therefore, Thames Exchange goes to the top of the list for further consideration, as does it’s neighbour Vintner’s Place. Thames Exchange and Vintners Place were both HSBC buildings and both buildings are situated right across the road from each other, with Queen Street Place literally bisecting the 2 buildings. Queen Street Place is also the road that acts as the approach road to Southwark Bridge, with the 10 Queen Street Place building and the Vintners Place building literally creating a canyon either side of the road. You will see below why Queen Street Place is interesting. Queen Street Place is very near the Bank of England and is in the City of London, so it’s under City of London Police protection. It’s also very near the River Thames, as is the JP Morgan London vault. To get to the Bank of England from Queen Street Place, you literally walk a mintute north up Queens Street, and then a few minutes north-east along Queen Victoria Street and you’re at the Bank of England. An official HSBC letter-headed note documenting the Thames Exchange address and proving HSBC occupied this building can be seen here. Similarly, an official letter-headed note documenting the Vintner’s Place address, and proving that HSBC occupied that building can be seen here. “HSBC has stepped up its retreat from the City of London by instructing agents to open negotiations on the disposal of its outstanding City liabilities. In one of the most hotly contested pitches of last year, Jones Lang Lasalle has beaten rivals to secure the lead role as strategic adviser for the bank’s relocation to Docklands [Canary Wharf] in 2002. “Morgan Pepper is advising on HSBC’s 17-year lease at Thames Exchange, 10 Queen Street Place, EC4. The Scottish Amicable building is currently under offer to Blackstone Real Estate Advisors for £73m. Insignia Richard Ellis, Chapman Swabey, Strutt & Parker and Wright Oliphant have positions on the bank’s remaining interests in Vintners Place EC3; Bishop’s Court at Artillery Street, and HSBC’s 37,160 sq m (400,000 sq ft) office complex at St Magnus House and Montagu House. By the time STREETracks Gold Trust (the original name for the SPDR Gold Trust) was launched in 2004, HSBC Bank USA’s address had moved to HSBC’s new headquarters in Canary Wharf, in the Docklands, east of the City of London. By early 2003, Equity Gold Trust also listed the HSBC custodian with the Canary Wharf address. However, the old HSBC gold vault did not ‘move’ at the time the rest of HSBC moved lock, stock, and barrel to Canary Wharf between 2002-2003. In fact, the HSBC vault remained where it was in a slightly rundown shabby space with cream-colored walls. See multiple photos of the vault space below. The HSBC vault did however transform from an ‘old’ vault into a ‘new’ vault sometime between 2006 to early 2007. My belief, which I’ll explain below, is that this vault didn’t move, it just received an extensive renovation. A diagram of the HSBC headquarters in Canary Wharf where the whole London HSBC workforce moved to by early 2003 can be seen below. Notice the car parks in basements B2, B3 and B4. You can also read about the basement construction in the Arup document above. This is not the location for a beat-up old vault that can be seen in the below old gold vault shots. Besides, the vertical pillars/piles in the old and new HSBC vault are nothing like the huge structural pillars/piles found in the HSBC headquarters in Canary Wharf. The pillars in the old HSBC vault photos are pillars that would be found in an old arched vault, while the support pillars in the new HSBC vault photos are those that would be found in relatively shallow spaces under a road, such as pillars/supports used in the cut and cover New York subway system. Notice the very old piping around the top of the walls. ‘Old’ vault looks quite beaten with concrete pillars, old floor, old air conditioning unit, and awful decor, and some type of desk an chair and wiring on the very right hand side of the photo. When the gold is stacked 6 pallets high, as in the above photo, it nearly reaches up to where the pillars start to broaden out. Recall for a moment the definition of a vault. A vault is any space covered by arches, or an arched ceiling over a void. This is why the Bank of England ‘vaults’ are called vaults, because in the old vaults of the Bank of England (before the Bank of England was rebuilt in the 1920s/1930s), the gold was stored in the arched vaulted basements. The pillars in the shots of this ‘old’ HSBC vault look like pillars/piles that are the lower parts of arches, since they taper outwards as they go higher and they are positioned in a grid like formation. You can see how all the pallets of gold were located in a space with quite a lot of walls and chunky support pillars that broaden at the top (i.e. support pillars). Very similar pillars can be seen in old parts of the London Underground pedestrian tunnels, and also in the Vintner’s Hall wine vaults, which is next door to the vaults under Queen Street Place. “The gold in trust at HSBC’s gold vault in London. The gold is being held in Trust for the shareholders of GLD. These images as at June 2007? This STREETTracks web page can be accessed via the following link, however, the photos don’t render properly. However, I did source the photos in other dated instances from a similar link, and uploaded them. See below. George Millin-Stanley’s watch puts the time at 11:45am. he says “the fellow on the left is a 10-year younger version of me“. He also says: “That was the old vault when we started doing it, and you can see that we are doing a bit of a check“. 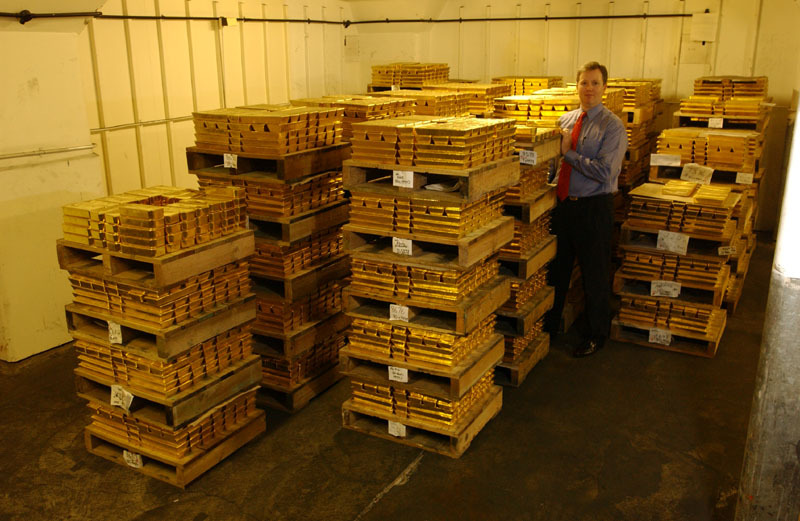 Then Tuckwell goes on to say: “This photograph was taken just over a year ago on a recent vault visit“… “Our gold, from the London product, the GBS, is on the left and the gold from the US product, the GLD, is on the right in this picture“. GBS was the Australian product and GLD being the State Street product, listed in November 2004. As it turns out, there are vaults beneath the road under Queen Street Place, between 10 Queen Street Place (Thames Exchange) and Vintners Place, and these vaults were renovated during the period that would coincide with the HSBC London gold vault transforming from an ‘old’ vault to a ‘new vault’. Southwark Bridge is a bridge over the River Thames connecting the City of London (financial district) on the north bank of the river, to the area of Southwark on the south bank. The first Southwark Bridge (Queen Street Bridge) opened in 1819 and was an arched bridge with “vaults under the north abutment of the bridge“. There is also a reference to the vaults under Queen Street Place in a 1908 Corporation of London Record Office record. A second bridge, the current Southwark Bridge, replaced the earlier bridge, and it opened in 1921. A book titled ‘Design Applications of Raft Foundations‘, when discussing the development that became Vintners Place, mentions the vaults under Queen Street Place and shows that the vault space begins maybe 2.0 metres under the roadway, and with the vault space height being about 5 metres high which looks a very similar height to both the ‘old’ and ‘new’ HSBC vault spaces. In fact, there were up to 17 vaults under Queen Street Place judging by a planning application from 1992 which listed a Vault Q (assuming Vaults A – Q), and the application said that the vaults had been used for storage. Keeping in mind that the ‘old’ HSBC gold vault became a ‘new’ HSBC gold vault sometime in 2006, or early 2007, then the following, in my view, becomes highly relevant. In September 2004, a building control planning application was submitted to City of London planning department for Alterations to Vaults in the Thames Exchange building at 10 Queen Street Place. See link for the application. See screenshots also. Following this in November 2005, another building control planning application was received by the City of London planning department for “Fit out of Vaults between 10 Queen Street Place and Vintners Place“. See link below and also screenshots. Property investor Jaguar bought the 10 Queen Street Place building from Norwich in 2008, and then the Malaysian haji pilgrims fund purchased 10 Queen Street Place from Jaguar in September 2012. Coincidentally, Vintners Place, which adjoins Queen Street Place on the other side of the vaults was also sold in September 2012 when Downtown Properties and a South Korean consortium bought it from Atlas Capital. The tenants at the time included Jefferies International, and Sumitomo and Thomson Reuters. Vintners Place also adjoins Thames House, Five Kings House, and The Worshipful Company of Vintners also has its headquarters in a building called Vintner’s Hall on the corner of Queen Street Place and Upper Thames Street. Detailed plans of the vaults under Queen Street Place before and after the ‘Alterations’ and ‘Fit Out’ can be seen here ( Vault Plans – Before 10 Queen Street Place – Vaults – Lower Ground Floor Plan – Before alterations) and here (Vault Plans – Proposed 10 Queen Street Place – Vaults – Lower Ground Floor Plan – After alterations). Both sets of plans were drawn up by Hurley, Robertson Architects. Click on the links to bring up the actual pdf files of the full plans. And more zoomed in. Notice all of the individual vaults and doors, and all of the walls with rows of pillars marked between the walls. Compare the above plans to the ‘proposed’ plans. In the proposed plans, which are revision C08 dated 06 April 2006, all of the individual vaults have been removed by removing all the doors and walls, leaving just rows of pillars, and beams (given that it’s a top-down view looking down). You can see the changes a bit more clearly in the following slightly zoomed in version. Notice the facilities added on the right, such as toilets, kitchen, changing rooms, office, telecoms room etc, and also the rows of supports/ pillars on the left hand side, which is about 7 rows of supports / pillars in the open space, 5 of which run at the same angle, then there is a V shape where the pillars then run at a different angle. Anyone who has the inclination, given these sets of plans of the vaults under Queen Street Place, please check back over the photos of the ‘old’ HSBC vault and ‘new’ HSBC vault and decide for yourself if the photos in the ‘old’ cramped vault with the pillars and cream wall is reminiscent of the pre-alteration plans above. Likewise, decide for yourself if the ‘new’ HSBC London gold vault with the open plan design and layout of vertical steel support columns looks like the plans above of the ‘proposed’ alterations and ‘Fit Out’ of the vaults under Queen Street Place. When G4S built its subterranean gold vault in Park Royal, London in 2013 / 2014, it fitted it out the area beside the vault with toilets and a kitchen – See second last sentence in red box below from the G4S building contractor document. Because, if you are working down in a vault all day, there will need to be toilets and a kitchen area, as well as changing rooms, phones and desktop computers etc. For background to G4S vault, see “G4S London Gold Vault 2.0 – ICBC Standard Bank in, Deutsche Bank out“. Now we come to the Bob Pisani videos that were filmed by CNBC in the HSBC London gold vault in 2011. I say videos in plural because there are 4 video segments, and actually 5 segments in total including a trailer. The videos are quite exciting and fast-paced but frustrating because the camera is quite shaky and moves around rapidly for a lot of the vault segments, possibly on purpose. The background music is quite catchy also (at first). The first video is on a CBNC web page and embedded in an article titled “Gold’s secret hiding place”, however the video is titled “Gold Rush – The Mother Lode”. Its dated Wednesday, 31 Aug 2011 with a byline of “CNBC’s Bob Pisani recently got an exclusive inside look at the HSBC gold vaults in London, where the gold for the SPDR Gold Trust (GLD) is stored.” The video is 4:55 mins long, and introduced by Pisani from the New York studio. The vault shots begin at 1:18, and interestnigly, at 0:40 mins, the camera is in a vehicle travelling down Lower Thames Street. There is a neat online app called Pause House which allows you to look at any YourTube clip frame-by-frame, and can be used on the above clip for those who want to get a good look at the vault interior. (Pause House). Lets call this the Third version. Its 2:43 mins long. Pisani starts on Waterloo Bridge on the River Thames and he points towards Westminster Bridge (the exact opposite direction to Southwark Bridge). Then he is in the blacked-out vehicle, and then in the vault from 1:04 mins. At this stage the music might be annoying, so luckily, there is no background music when Bob talks in the vault. 5. Version 5 is just a 31 second trailer about the CNBC 2011 gold series, published in March 2012, with gold vault footage only appearing for a few seconds. There is one sentence in both “Motherlode” and “Gold’s Secret Hiding Place” that I consider very interesting. And it relates to the ‘old’ and ‘new’ vaults. What Bob Pisani says has obviously been told to him by someone at HSBC, since he would not know anything about the vault in advance. At 3:37 mins in Motherlode, Pisani says “In 2005, there was less than 200 tonnes of gold here, now there’s 6 times as much“. Pisani is essentially saying, probably without realising, that it is the same vault. i.e. that the vault in 2005 is the same vault as in 2011. However, given that the vault in 2005 was the ‘old’ vault, and that the vault in 2011 was the ‘new vault’, this suggests that it is the same space, and that the vault space was just renovated. It therefore supports the view that the vaults under Queen Street Place are a very strong candidate to be the HSBC London Gold Vault that stores the GLD gold and the ETF Securities gold. You might have spotted above that one of the existing vaults under Southwark Bridge was turned into a riverside walkway. This was probably vault Q, which looked to be the vault nearest the river. This walkway runs under the beginning of the abutment on the north of SouthWark Bridge and is called the slightly humorous name ‘Fruiterers Passage’. The Passage was opened circa the year 2000 (and named after the Worshipful Company of Fruiterers), and is ornately tiled with ceramics, even around its pillar enclosures. Take a look at a photo of Fruiterers Passage and compare it to a photo of the new ‘HSBC’ gold vault that features the yellow-painted steel support pillars. The dimensions and spacings of the pillars in both photos look very similar, even identical. Although there are lots of security cameras around the City of London, the cameras in Fruiterers Passage and security warnings near the entrance to the Passage seem particularly explicit. A MarketWatch article from 11 January 2008 quoted George Milling-Stanley as saying that the vault was sizable but “not quite as big as a cricket pitch.” On another occasion, Milling-Stanley used another sporting analogy and described the ‘new’ vault as “about the size of a football field“. Can a sporting analogy (or two) help determine the size of the HSBC London gold vault? Possibly, but it’s not as clear-cut as you might think. Notwithstanding that a ‘cricket pitch’ is the (smallish) 22 yard strip between the wickets, the quotation was presumably referring to a ‘cricket field’. However, there is no standard shape of a ‘cricket field’, let alone standardised dimensions, since the ICC rules only state that the field can be circular or oval with a variable diameter of between 450 and 500 feet on the ‘long’ side (sometimes giving 16,000 sq yards). Regarding Milling-Stanley’s ‘football field’, analogy, it’s not clear whether this analogy was intended for a US audience or non-US audience. So it could mean ‘American’ football, or soccer or rugby. In soccer, there is no standard size ‘field’. The sidelines (touch lines) have to be between 100 and 130 yards (110 to 120 yards for international matches), while the goal lines (end lines) must be between 50 and 100 yards (70 to 80 yards) in international matches. This could result in over 7000 sq meters or over 1.75 acres. The American football field is thankfully standardised, being 120 by 53.33 yards or 6400 sq yards. Overall, Milling-Stanley’s descriptions give a flavour for permissible dimensions, but based on Bob Pisani’s video tour, I see the vault as a rectangular space but not quite as big as a soccer pitch. So lets look at the space in Google Earth. I’ve just added a yellow rectangle for illustrative purposes to show where the vaults under Queen Street Place are located. See also some cross-sectional plans that were part of the 2004 Blackstone Thames Exchange planning applications (Cross Section width 10 Queen St Place – from river view and Cross Section length 10 Queen St Place). The Marketwatch January 2008 article also said that the HSBC vault was “located on the outskirts of London” but how would the journalist know this since the same article also said that “a spokeswoman for HSBC declined to provide vault details, citing security policies”. As financial journalists mostly repeat what is told to them, I think this “located on the outskirts of London” bone was thrown out as a red-herring, and means the exact opposite. b) based on modelling the number of realistic-sized pallets that could conceivably fit into the Queen Street Place vault space (as per the vault plans), it also seems that it would be hard pressed to store 1,200 tonnes, unless they were crammed in. And the pallets in the CNBC segments are not fully crammed in to the space. Remember also that the 1200 tonnes of gold reference only referred to the SPDR Gold Trust holdings in mid-2011 around the time the CNBC video segment was filmed. See blue line in chart below (chart from www.sharelynx.com) for GLD holdings over its lifetime. HSBC is also the gold custodian for ETF Securities’ gold-backed ETF which held about 170 tonnes at the time of Pisani’s visit. That would be nearly 1,400 tonnes of gold just between the GLD and ETFS holdings, which would be about 228 piles of pallets stacked 6 high crammed in. Furthermore, that’s not even taking into account any gold holdings of other HSBC customers, and Pisani also says in the videos that HSBC confirmed to him that its vault also stores gold for a range of clients. When GLD held 1353 tonnes in December 2012, this in itself would be 225 piles of pallets, each 6 high. ETFS held about 170 tonnes in December 2012 also, which would be another 28 piles of pallets stacked 6 high. If this location is the famous storage area for the SPDR Gold Trust then possibly during the boom times when GLD holdings peaked, the HSBC vault may not have been big enough to accommodate the GLD gold let any other gold. Which would mean that HSBC was storing GLD gold elsewhere such as at the Bank of England vault, or the JP Morgan vault, both very close to Queen Street Place. It would also mean that GLD sources new gold inflows from gold that is at the Bank of England, i.e. leased central bank gold. Another point to consider is that if the vaults under Queen Street Place are the correct location for the HSBC vault, then where did the gold that was being stored there in late 2005 / early 2006 go to during the vault alterations? This would have been at least 200 tonnes of gold as of late 2005, rising to over 350 tonnes of gold by late 2006. As the Bank of England is literally up the road from Queen Street Place, moving it to the Bank of England vaults would be the most likely option during the renovation. In summary, using publicly available information and evidence, I have described where I think the HSBC London gold vault may be located. Whether I am correct is another matter.